(Nanowerk News) Rutgers University–New Brunswick engineers have created a smart wristband with a wireless connection to smartphones that will enable a new wave of personal health and environmental monitoring devices. Their technology, which could be added to watches and other wearable devices that monitor heart rates and physical activity, is detailed in a study published online in Microsystems & Nanoengineering ("Fully integrated wearable impedance cytometry platform on flexible circuit board with online smartphone readout"). “It's like a Fitbit but has a biosensor that can count particles, so that includes blood cells, bacteria and organic or inorganic particles in the air,” said Mehdi Javanmard, senior author of the study and assistant professor in the Department of Electrical and Computer Engineering in the School of Engineering. 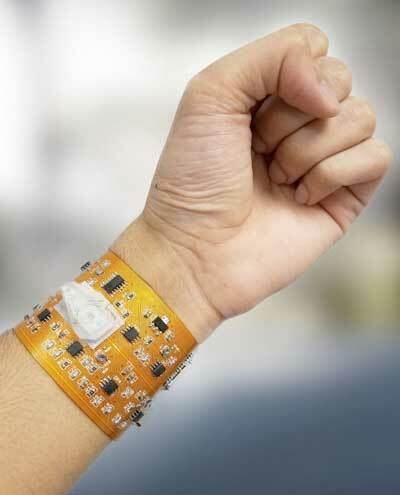 The plastic wristband includes a flexible circuit board and a biosensor with a channel, or pipe, thinner than the diameter of a human hair with gold electrodes embedded inside. It has a circuit to process electrical signals, a micro-controller for digitizing data and a Bluetooth module to transmit data wirelessly. Blood samples are obtained through pinpricks, with the blood fed through the channel and blood cells counted. The data are sent wirelessly to an Android smartphone with an app that processes and displays data, and the technology can also work in iPhones or any other smartphone. In the field, offices and hospitals, health professionals could get rapid blood test results from patients, without the need for expensive, bulky lab-based equipment. Blood cell counts can be used to diagnose illness; low red blood cell counts, for instance, can be indicative of internal bleeding and other conditions. Next-generation wristbands could be used in a variety of biomedical and environmental applications, he said. Patients would be able to continuously monitor their health and send results to physicians remotely.